Bevin Bounces Back to Win Tour Down Under Sprinter's Jersey! Bevin finished the first WorldTour race of the season with a stage win and the sprinter's classification jersey. Cor Vos photo. Bevin crashed heavily with less than 10km to go in Stage 5, and had to grit it out to finish Sunday's final stage. Cor Vos photo. Bevin showed his fitness and speed in Australia, wearing the GC leader's jersey for 4 days. Cor Vos photo. CCC Team rider Patrick Bevin bounced back from a heavy crash on the penultimate stage of the Santos Tour Down Under to finish the six-day stage race in Australia Sunday and win the sprint classification. The New Zealander put in a gutsy performance, pushing through injuries sustained in Stage 5 to finish the final stage to Willunga Hill on his TCR Advanced SL team bike. X-rays and CT scans Saturday evening after his Stage 5 crash confirmed that Bevin did not suffer any fractures or internal injuries, but a bruised hip and ribs, plus multiple contusions, made for a tough day of racing. After winning Stage 2 earlier in the week, Bevin held the overall lead until the final stage, starting Stage 6 with a 7-second lead over South African Daryl Impey. Protected by his CCC Team, Bevin stayed with the lead group until the first ascent of Willunga Hill, where he was unable to keep pace with the leaders. 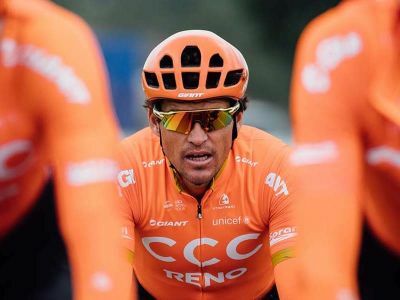 Australian Richie Porte ended up winning the final stage, and Impey took the overall—but Bevin was happy to win the sprint classification and continue the momentum of a strong start to his 2019 season. CCC Team sports director Jackson Stewart praised Bevin for his courageous performance at the first WorldTour race of the year. It was a strong follow-up to his win at the New Zealand national time trial championship the previous week and helped get the team off to a hot start in 2019.